Sure, 3D printing is cool, but a startup in Fargo, North Dakota, is taking it to the next level. 3DomFuel is recycling a collection of unusual products and turning them into material called filament that can be used for 3D printing. 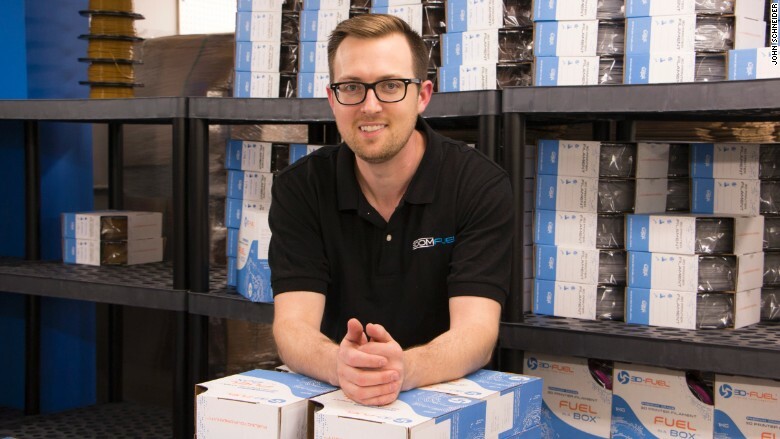 "You can 3D print products made from beer, coffee and hemp," said 26-year-old John Schneider, cofounder and chief marketing officer of 3DomFuel, a maker of 3D print filament dubbed 3D-Fuel. "The dominant material for 3D printing is still plastic for both desktop printing and commercial 3D printing," he said. But Schneider and his business partner Jake Clark, 24, were itching to try something unique. "It's already a pretty competitive market for plastic filaments," Schneider said. "We wanted to differentiate ourselves." Their search for unconventional materials began in 2015. "We found a local company that specialized in mixing agricultural waste with plastics to create new materials," he said. "It was doing this with coffee waste from local roasters and we decided to try it." Although it took about a dozen tries before the process worked, the duo was pleased with the results. 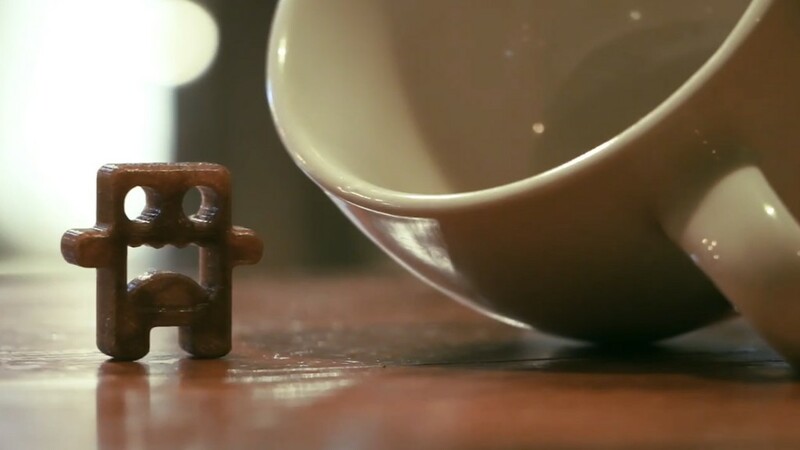 Not only was 3D-Fuel able to extrude the coffee-based raw material into filament, "it also smelled so good, like sweet latte," said Schneider. Aesthetically, the coffee filament -- appropriately called "Wound up" -- offers more texture than plain white and off-white alternatives. "The color of it is deep brown with varying shades of brown flecks in it," Schneider said. What could you make with it? "It's perfect for printing novelty items like coffee filter holders and sleeves for cups but not a coffee cup itself," he said. "It's still plastic material and not ideal for hot beverages." Coffee was only the beginning: "It worked out so well for us that we wanted to try other intriguing materials," Schneider said. John Schneider, co-founder and CMO of 3DomFuel. Those included beer and hemp. The beer filament, called "Buzzed," is made using waste material from the malting process mixed with plastic. Meanwhile, the 3D hemp filament is called "Entwined" and includes byproduct from industrial hemp crops mixed with plastic. 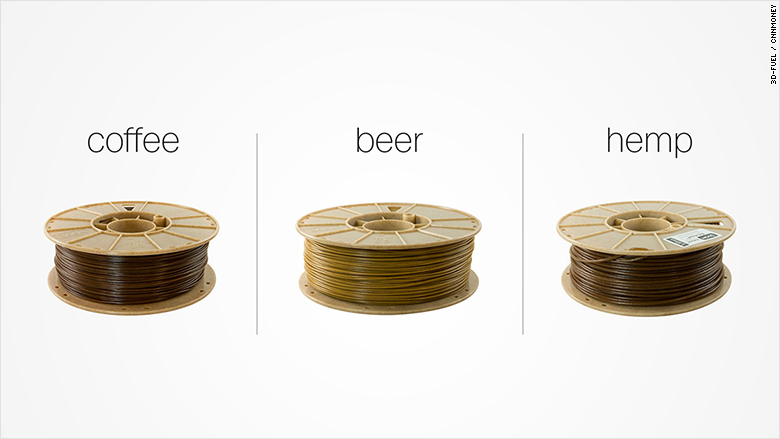 "Many people have asked us if the beer filament smells like old beer. Luckily it doesn't," he said. "It's pleasant, like freshly-harvested barley." The smell, however, evaporates once the printing is done. "It's the same thing with the coffee-based material," he said. Currently, 30% of 3DomFuel's product mix includes filaments made from unusual materials. "We're already experimenting with more materials to grow our offerings of recycled filaments," he said. 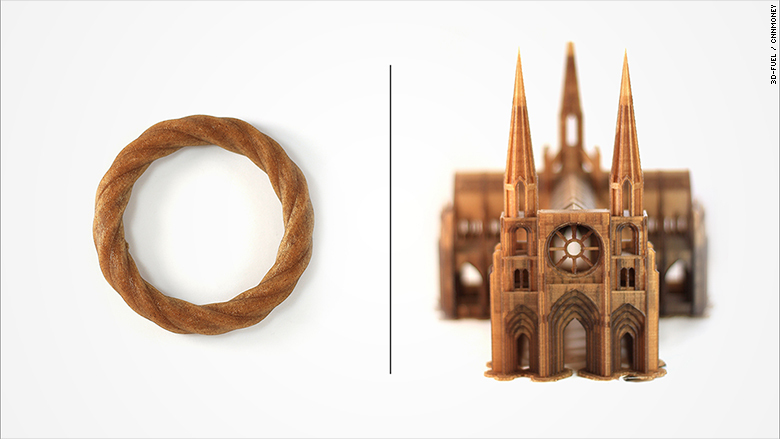 A bracelet made from the hemp filament [left] and a minitature catherdral made from the coffee filament. 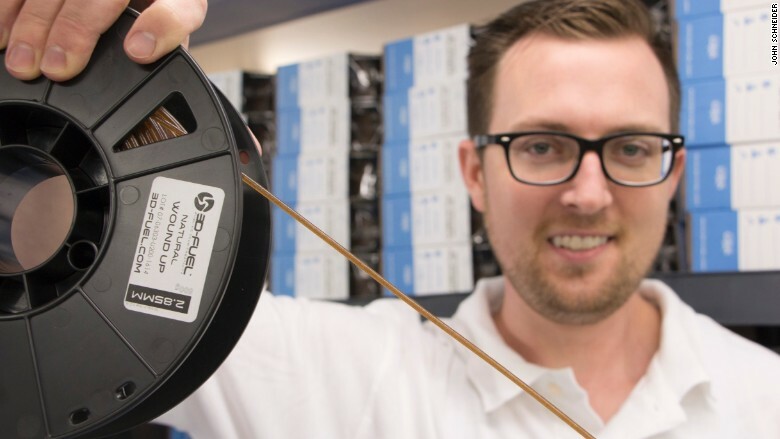 Even though coffee, beer and hemp-based filaments cost about 60% to 80% more than the standard plastic filament (with an average price of $49.99 for a 500g spool), Schneider said demand has been robust. "The word is spreading," he said. "We're seeing double-digit sales for these materials." Schneider said customers are using Buzzed to 3D print custom beer tap handles, coasters and 6-pack holders, too. "Folks from the hemp industry have reached out to us," he said. "They love seeing other innovative ways to use hemp." Schneider hopes the recycled filaments can one day be embraced by larger industries such as medical and aerospace manufacturers. Schneider holding the filament made from coffee waste. The efforts could also help address a longstanding question around waste in the 3D-printing industry. "We're often asked what we do with old materials and old prototypes," said Schneider. "Now, we can show consumers how we are using renewable resources to support sustainable manufacturing."